The Govt. of Maharashtra along with partnership with the central govt. has launched the UJALA scheme for the state in a recent meeting. This launching function was held on April, 2016 and the place from where the joint announcements to provide LED bulbs at cheap rates were made is Bhopal. This is a flagship project of the Govt. of India where it wants every home in India to have these LED bulbs as soon as possible so that the net power or energy consumption rate comes down and the carbon emission rates can also be checked. 14 Places of LED bulb distribution DISCOM offices, Electricity bill cash counters, EESL kiosks, weekly markets, etc. What is the working plan of the UJALA Yojana scheme in the state of Maharashtra? In the recent UJALA scheme launch, the working plan and project implementation strategy in the state of Maharashtra has been decided. Under this scheme, the Govt. has decided to provide low cost LED bulbs to the millions of households of Maharashtra, just like they are doing in the rest of the country. Under this LED bulb distribution scheme, 3 crore such bulbs will be sold at very cheap rates to the state people of Maharashtra. This is the first step of the project implementation which will be finished within six months of start of the project. Special DISCOM offices and kiosks are being set for this distribution. A total number of around 3 crore such LED bulbs will be distributed for the people of Maharashtra under this UJALA scheme. The LED bulbs are designed with liquid emission diode technology which is the latest in the technology used in lighting products. This technology serves both purposes of high luminosity and less consumption of power. This results in lessening the overall carbon emission in the environment. 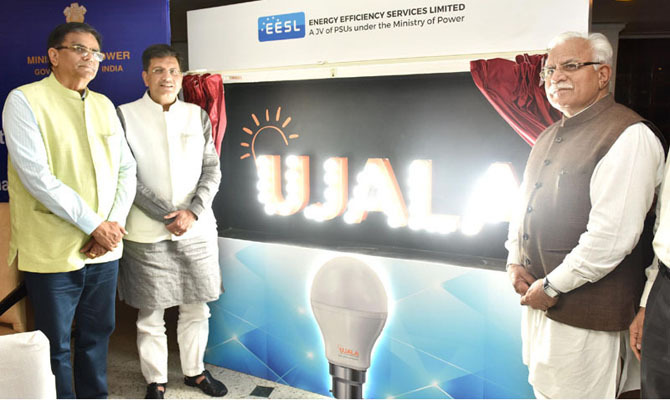 Every UJALA bulb consumes around 9 watt of power. But the output of these LED bulbs is equivalent to the 100 watt normal bulbs. So these LED bulbs are ten times more energy as well as cost efficient than normal bulbs. The LED bulbs also illuminate at the rate of 900 lumens per bulb. The Govt. has set a target of distributing 3 crore bulbs in Maharashtra in the first leg of implementing the UJALA scheme. So the LED bulbs under the UJALA scheme will be available for purchase from all the electricity bill cash deposit counters maintained by DISCOM. Apart from that, all the DISCOM offices will sell these LED bulbs. The Govt. will set up separate kiosks of EESL that will distribute these LED bulbs. Also weekly local markets will also be arranged by the state govt. so that more citizens could be reached out and LED bulbs would be distributed. Only a valid identity proof is required to buy these LED bulbs. What is the future objective of the EESL regarding the UJALA Yojana scheme? By far, 13 states of India have been brought under this UJALA scheme. As per the EESL officials, this project of distribution of energy efficient LED bulbs for the common people throughout the nation will be successful only by the joint co – operation among the Central govt. and the respective state governments. After its launch in the year 2014 – 2015, EESL was able to distribute only 30 lakh LED bulbs. But in the last year, this number shot to a record 9 crore. An estimate of around 77 crore bulbs which are not energy efficient but are being used has to be replaced as soon as possible. EESL has set a deadline of March 2019 for completing this project. It aims to achieve the target of 20 crore this year. With the implementation of UJALA scheme all over the nation, the total energy consumption will surely come down. As per calculations, a LED bulb is 10 times more energy efficient that other bulbs. As per EESL data, about 1,298 crore kWh power consumption has been saved by the use of UJALA bulbs over the last one year. This has also resulted in reduction of carbon emission by 1 crore ton per annum. And the regular use of LED bulbs has also been pocket friendly to the consumers. An annual reduction of Rs. 5,195 crore in electricity bills can be estimated after total implementation of the UJALA scheme throughout the nation. On Sunday, PM launched 81 investment projects for over Rs 60,000 crore. According to the sources, the PM has declared that the cost was saved in the past three years under a particular scheme, touted as the Ujala scheme. While people have already claimed the event as a ground-breaking one, PM Narendra Modi believes in calling it a record-breaking ceremony. With the new launch, Uttar Pradesh has witnessed mammoth development in a short span, which hasn’t been seen before. With the implementation of newer methods, the state is yet to witness more development in the near future.